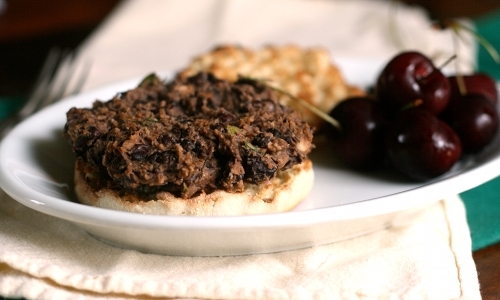 The problem with these black bean burgers was that I called them burgers. Given recent conversations with my husband, one might have thought the problem ought to be the fact that the main ingredient is black beans. Yes. He’s ‘sworn off’ beans for awhile. That statement didn’t bother me much. You can’t really swear off a certain ingredient when you’re not the one cooking, are you? A valid question. I freeze everything. The problem? We do get around to eating stuff in the freezer and those burgers he was longing for? Ate them last week. The solution to the problem was mostly easy. I told him we wouldn’t have black bean burgers and he was happy. I served him a ‘black bean patty’ on top of fresh romaine and he sang the praises of our dinner. You see, to him, burgers = beef. Call it a patty and he’s happy! 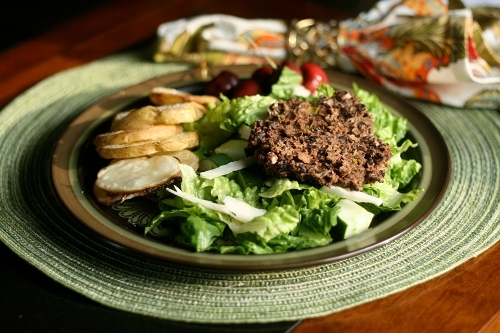 If you’ve ever had a black bean burger that was mushy, insubstantial, and squished out the back of the bun when you took a bite, consider the preparation below that calls for baking them. This method keeps the patties firm for even the biggest biters! Place 2 cups of the black beans in the bowl of a food processor and pulse until chunky. Alternatively, you can mash the beans with a form. Transfer to a large mixing bowl. Add remaining whole black beans, plus panko, egg, scallions, fresh herbs, garlic, cumin, oregano and red pepper flakes and mix until well combined. Prepare a baking sheet with nonstick spray and form bean mixture into patties 3 inches in diameter. Place patties about 1″ apart and bake 20 minutes on one side, then flip and continue baking 10 minutes. Serve with cheese, tomatoes, guacamole, or avocado. This entry was posted in Activities, Advice, Brady Evans Venables, Columbia, Cooking, Famously Hot, Food, Lexington, Lexington Medical Center, Midlands, Recipes, Women and tagged Black Bean Burgers, Brady Evans Venables, Columbia, columbia sc, cooking, every woman blog, Famously Hot, food, hospital blog, Lexington, lexington medical center., lexington sc, Lexington Women, lmc, LMC every woman blogger, Midlands, Midlands Women, Recipes, South Carolina, South Carolina Women, Women, women's blog, women's hospital blog by Ashley Andrews. Bookmark the permalink.